Building a nation is synonymous with building industries in the nation. While a favourable environment – which our Government has fostered through the Make in India and Digital India initiatives – is definitely a catalyst which speeds up our nation’s growth, we need a diverse portfolio of industries to accelerate indigenous technology. With this in mind, Intel and the Department of Science and Technology (DST) have introduced the ‘Innovate for Digital India Challenge (IFDIC). IFDI- 2.0 is anchored by T-Hub Foundation, which is one of India’s largest Technology Business Incubators (TBI). The road to Industrial development is paved with a lot of challenges but the benefits of a flourishing industry outweigh these issues. By improving the social and infrastructural environment, we can make India the go to destination from not only domestic start-ups but also attract foreign investment which in turn helps build a better economy. IFDIC is an initiative that aims to do just that for Digital India. In order to help you understand the different aspects of technology, how they impact our economy and help our citizens; a webcast series called ‘Let’s Talk Innovation’ has been launched. You can interact with experts from the industry and the government to gain from their experiences towards building Digital India. As part of the series Shri. Jayesh Ranjan (Secretary, Information Technology, Govt. of Telangana) will be joining us live at 4:00 PM on the 3rd of February here. A member of the Indian Administrative Service (IAS) and an All-India Topper of the 1992 batch, and currently serving as Secretary, Information Technology in the Department of Electronics and Communications for the Government of Telangana, Shri. Jayesh Ranjan has quite the impressive background. He holds a Masters Degree in Psychology from Delhi University, a Masters in Public Management from Lee Kuan Yew School of Public Policy, NUS and a degree is Business Management from IIM, Calcutta. Aside from these, he has even done several courses from universities across the globe and has even done consultancy assignments for the World Bank, UN-ESCAP and several NGOs. Before taking charge as the Secretary of Information Technology, Shri. 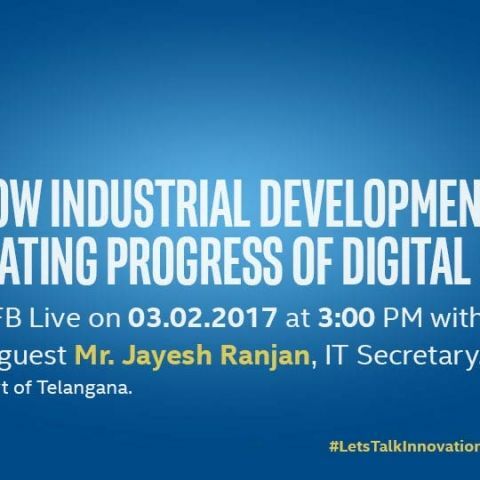 Jayesh Ranjan was the Commissioner of Industries and Managing Director for Telangana State Industrial Infrastructure Corporation (TSIIC). His responsibilities included identifying opportunities for bettering Industrial development in the state, and then nurturing industries by helping attract investment and providing the requisite infrastructure support. Suffice to say, there’s no one better than him to help you understand the nuances of fostering industrial development. The role of Industrial Development in accelerating the progress of Digital India. How Industrial Growth can impact start-ups. Impact of Industrial corridors in building smart cities. Role of technology and innovations in Industrial development. Challenges and opportunities of Industrial development.